If you are looking for networking opportunities in the state of Arizona, Blue Mail Media’s Arizona Business Email List can radically boost your campaign response rate, conversion rate and returns on investments. We maintain a huge data repository of records pertaining to numerous industries, business enterprises, key decision makers, C-Level executives, and professionals. Blue Mail Media’s Arizona Mailing List has been created by our highly dedicated team of data scientists, marketers, and professionals keeping in mind the marketing challenges faced by various businesses. While serving clients, we do not follow the ‘one size fits all approach’ as every enterprise has a unique set of challenges and priorities and putting them all in one bottle is not the right approach. Reasoned to the same, Blue Mail Media offers pre-packaged as well as customized Arizona Business Executives Mailing List that aligns perfectly with the multichannel marketing needs of marketers. Whether you wish to reach your prospects via telephone, email or mail, our mailing list allows you to meet the purpose with ease. You can get your database customized based on different selects such as Business Name, SIC/ NAICS code, job Role, Scale of Operations, Staff Size and others. 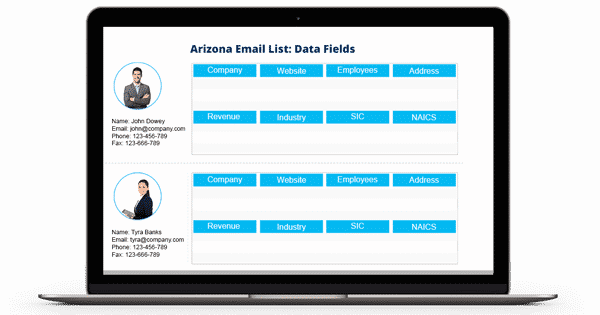 Our Arizona Email Database can be the greatest knowledge resource in your multi-channel marketing endeavours.